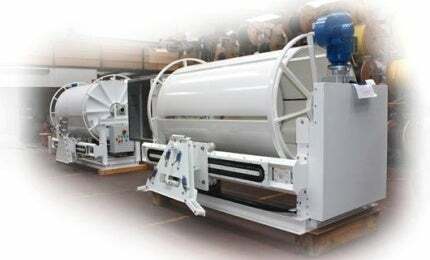 DR Italia supplies cable and hose reels, electrical / fluid slip rings and couplings for clients in the mining, minerals and heavy industries. The company’s full offering includes electrical collectors, electrical cables for moving machines, electrification systems and a selection of spare parts. DR Italia supplies motorised, hydraulic, electrical and spring-operated cable and hose reels to industrial clients. The company’s reel units ensure fast and easy access to equipment, for convenience and safety. A broad range of basic and specialised reels are available to meet the operational and storage needs of any application. Reel units are available in varied dimensions and can be supplied with cables, upon request. Motorised cable reels are recommended for applications that require a high level of reliable service, and simultaneously reduce maintenance. DR Italia spring cable reels are suitable for applications using high, medium and low-tension, in coverings with protection classes ranging from IP00 to IP68, as well as anti-deflagration and pressurised systems. The spring cable reels are operated by Archimedean spiral springs, offering an effective and economical solution for the electric power supply to mobile users. Use of special materials guarantees electrical insulation and a high mechanical and thermal resistance. DR Italia’s spring cable reel is ideal for mounting in small spaces and providing unmatched performance when equipped with suitable accessories such as an adjustable bracket and ratchet device. DR Italia manufactures slip rings for revolving cranes, rotating platforms and machines, drilling platforms and machine tools. They ensure electrical continuity from a stationary feeding point to rotating parts, transmitting power and control signals, both analogue and digital. Through its modular construction process, DR Italia can produce any type of collector and adapt it to the specific needs of each application. They can also be coupled with joints for transporting fluids. DR Italia offers custom-made slip rings on request, to meet the exact requirements of an application. DR Italia supplies products to clients in industrial fields such as mining and earth moving, drilling crane trucks, manufacturing, automation, iron and steel, water treatment, robotics and shipping. The company has the skills, experience and manufacturing capabilities to offer standard and custom-engineered products, as well as simple, reliable and secure technical solutions. DR Italia is ISO 9001: 2008 certified, and an ATEX – IECEX approved company. We are pleased to invite you to our stand in the next SEATEC fair, International Exhibition of technology, subcontracting and design for boats, yachts and ships that will be held in Marina di Carrara from 6 - 8 April in 2016. DR ITALIA is a dynamic ISO 9001/2000 certified company, born out of technological and professional experience matured within the leading companies in the sector of feeding of energy to moving machines.